To start off the new year, I thought I would throw in a a fun image that I shot early this afternoon panning with Hampton, our dog. I really enjoy playing with a 50mm lens on a full frame camera. To me, it shows normal, every day life at its best. There is no telephoto compression or the enhanced distance of a wide angle lens. The 50mm prime lens is a great lens to frequently visit because it forces you to adjust the composition by moving and not zooming. It doesn’t “give” you anything. As much as I enjoy using a variety of lenses in my photography, if I had to choose a favorite, it would be the 50. 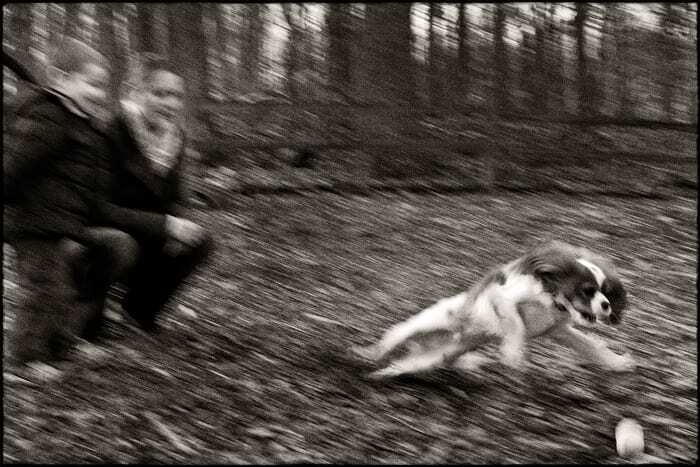 This image is a panning photograph taken at 1/50th of a second – moving with the dog. I chose this photograph because of his position, changing directions as the ball was thrown. It’s also important to have the ball in the photograph to get the full idea of what is happening. The micro-composition (to take a quote from my friend, National Geographic photographer, Sam Abel) is what is most important to me here. The only adjustments to this photograph are a conversion to black and white, a slight warm tone, a little bit of dodging and burning, and some film grain.